Ever since I was but five years old, when I found something that was interesting to me, I decided I had to learn everything that was possible to learn about that subject. If it got to a point where I felt I wasn't challenged, I dropped it and picked up the next thing. A short time after I really started fishing hard, I knew this was the thing that was never going to stop challenging me. Fly fishing even more so. I have been fly fishing for a fair while now. Just about 8 years. In that time, I have learned an awful lot. When I started, my dad basically gave me what I needed to get started, including some books, than said go to it. I had already been fishing like a mad man for a while, so I wasn't starting from scratch. I had a knowledge base to work up from. From the time I started, a complete novice, to now, where I consider myself and effective fly fisherman, I worked for knowledge. 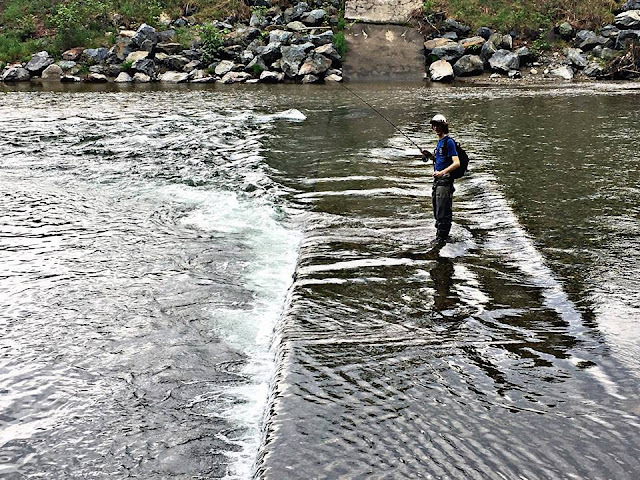 I started out with the intent of being the best possible fly fisherman I could be. Not to be the best fly fisherman in the world, not the pest in the country, not the best in the state. I wanted to get to the point where I felt I had nothing left to figure out. I know now just as clearly as I knew then that it would never happen, and that is part of why I love this. I will never, ever be bored. In my early days of wandering with a fly rod, I had a large body of resources to learn from, and I very quickly found the three that have become my mainstays for fishing knowledge: books and articles, people I met through fishing, and time on the water. Looking back, I can attribute every ounce of real success I've had on those three things. I read. I developed friendships with anglers that I could learn from. And I took what I read and was taught and applied it on the water, over and over and over, until I deciphered patterns. A few days after the great walleye bite I wrote about in "New Hat Walleye Bonanza", I saw the same weather conditions materializing. 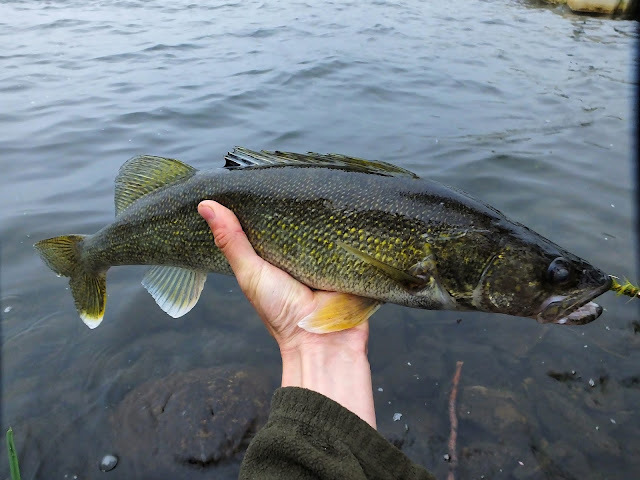 I new the water would be a couple degrees warmer, and that would likely change the result to a degree, but I saw it very likely that I would find walleye in the same places even if there weren't as many. And that's exactly what I found. This is what I can a result. A result is a repeatable, patternable bite that is found not through luck, report reading, or spot burning. A true result only comes through learning both on and off the water. While trying to make a point about the importance of working for a result on another social media platform I was misunderstood. Some people thought I was saying that learning from others wasn't worthwhile. That was kind of a silly thing for me to see thrown at me. Anybody that has fished with me for any amount of time would probably know that I value the exchange of ideas between co-anglers and mentors and students. I've been blessed to meet a great bunch of fisherman in my journeys, anglers kind enough to teach me what they had learned and generous enough to give me opportunities I wouldn't otherwise have had. I feel indebted to all of these people, and the only way I know how to pay that debt is to pay it forward. I've been fortunate enough to guide and instruct a fair number of people in recent years, and my proudest memories have been the moments when I watch someone I'm teaching start to 'get it'. I'm very far from where I want to be as an angler, and I'll be learning every day, but I feel that if I don't pass on bits and pieces of what I have learned I won't be doing my part. This is something immensely important at the moment, because I've seen a culture shift. 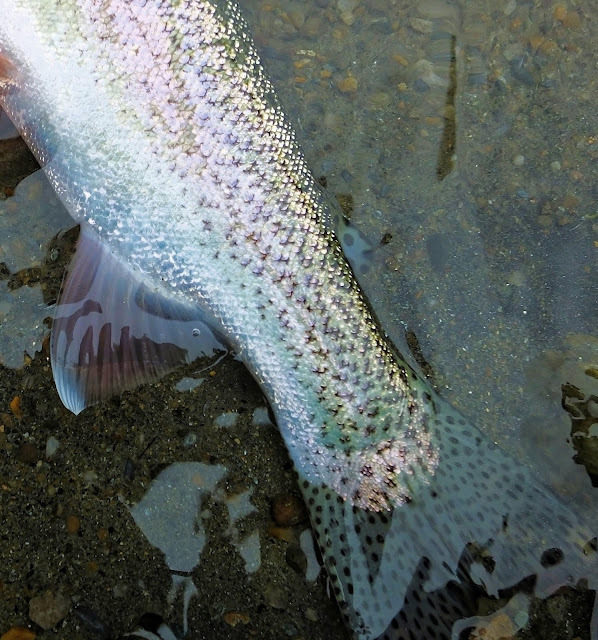 More and more anglers want something for nothing. We need this to change if this sport is going to be sustainable. No more zero to hero mentality. If you want to be looked at as a good angler, understand that you are going to have to work and learn. If you already have a lot of experience, pass the right parts on. Ultimately, if the only way to get more people fishing is to post constant fishing reports with exact details, trout stocking updates, and information about every fishing spot and what to do there, I'm not sure it's worth getting that many more people into the sport. If you have the means, find a novice, someone eager and young but not sure where to look, and teach them the right way. Teach them why. That's something you'll never learn by being a spot burner and report follower. That's what keeps traditions alive. Etiquette. Responsibility. Respect. These things are dying because it no longer takes learning from a mentor to catch a lot of fish. In late August, 2011, Hurricane Irene, at the time actually a tropical storm with minimal winds, impacted Vermont. With no coastline and little potential for wind damage during this storm, many would have believed a tropical storm wouldn't severely impact this state. That turned out not to be the case. In it's dying state a tropical storm turns into a rain making machine, dropping every once of moisture that had stayed with it since it left warm waters. Irene was carrying a lot of water. 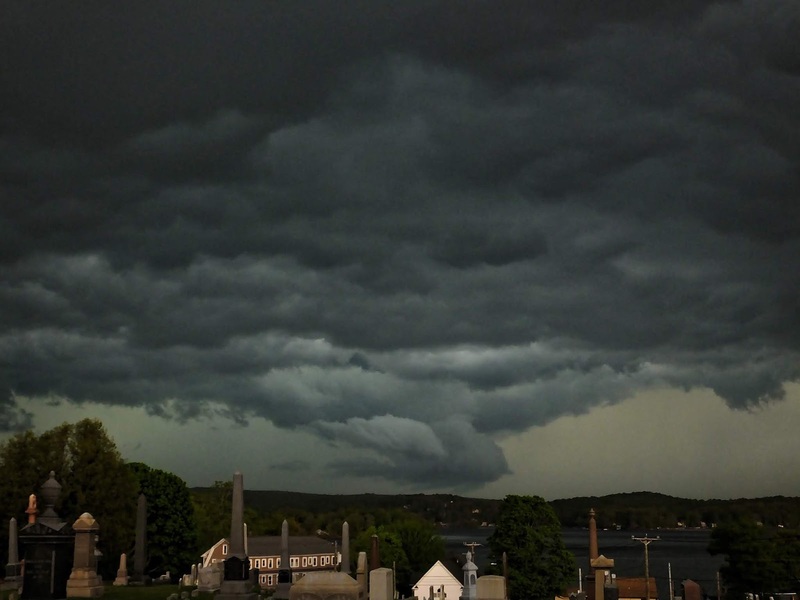 When it passed over Vermont, it dropped as much as 10 inches of rain in under a day. The results were catastrophic. Even small streams exploded over their banks. Roads were undermined and washed away. Bridges buckled and collapsed. Homes and businesses crumbled as the ground under them was washed away. 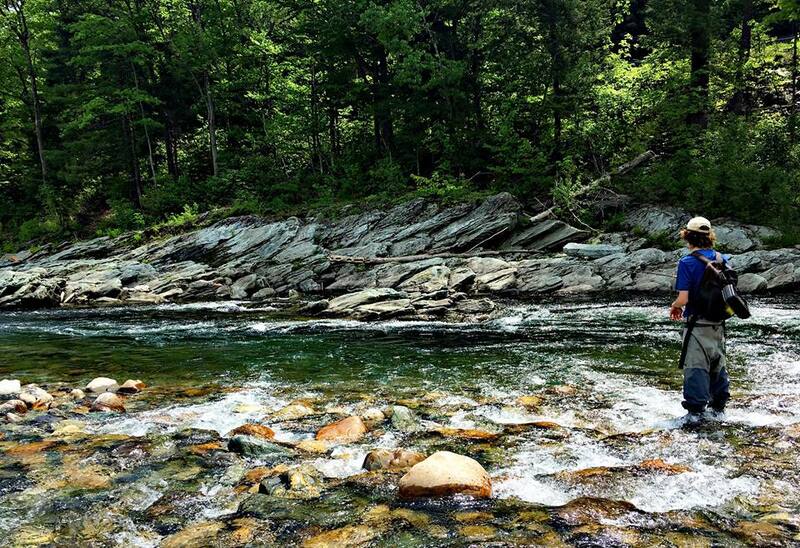 Before the storm the White River and its branches had been one of Vermont's most exceptional wild trout streams. It was always overshadowed by the Battenkill, and didn't get the fishing pressure it could have pulled with its robust wild rainbow and brown trout population, but everything I read from the years before Irene made it sound as though this was a truly exceptional river system. Irene did not spare this watershed. The river rose more than 10 feet above flood stage. Not 10 feet above average. 10 feet above flood stage. The destruction to both the aquatic life and the riparian zone was incredible. The bottom was scoured out. Banks were scraped clean of all vegetation. Water quality decreased with numerous hazardous waste spills. 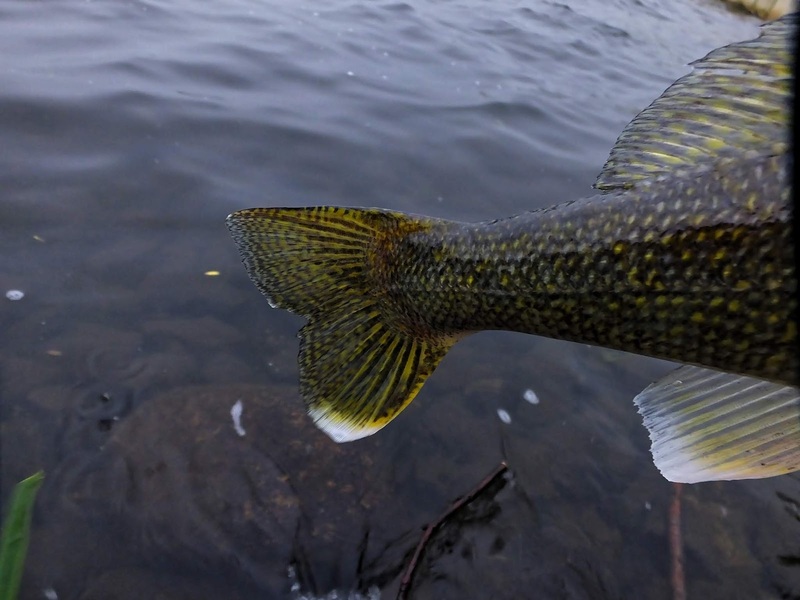 Once thriving macro-invertebrate populations essentially vanished along with smaller fish. Silt deposits built up. 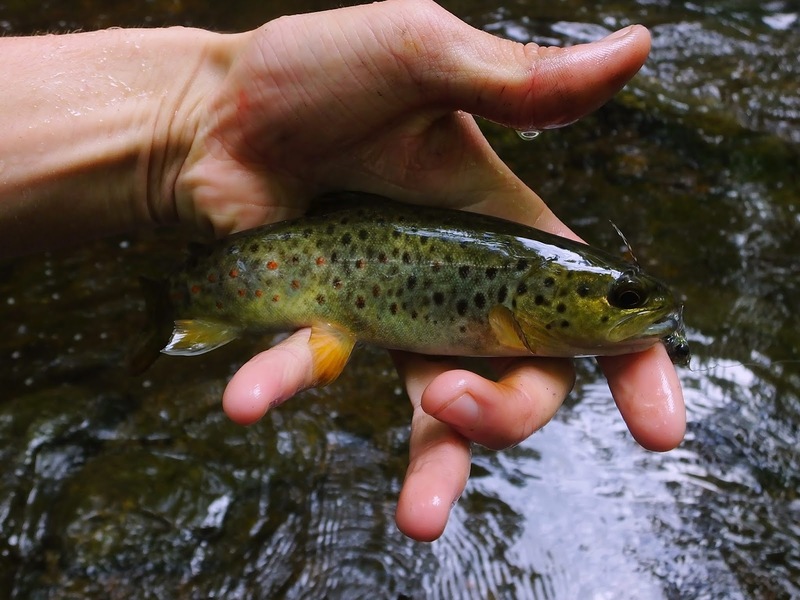 Wild trout populations decreased at an alarming rate, with some streams seeing numbers cut by more than half. In the six and a half years since Irene, the watershed has not recovered completely, and it may be many many years before it is what it used to be, if ever. 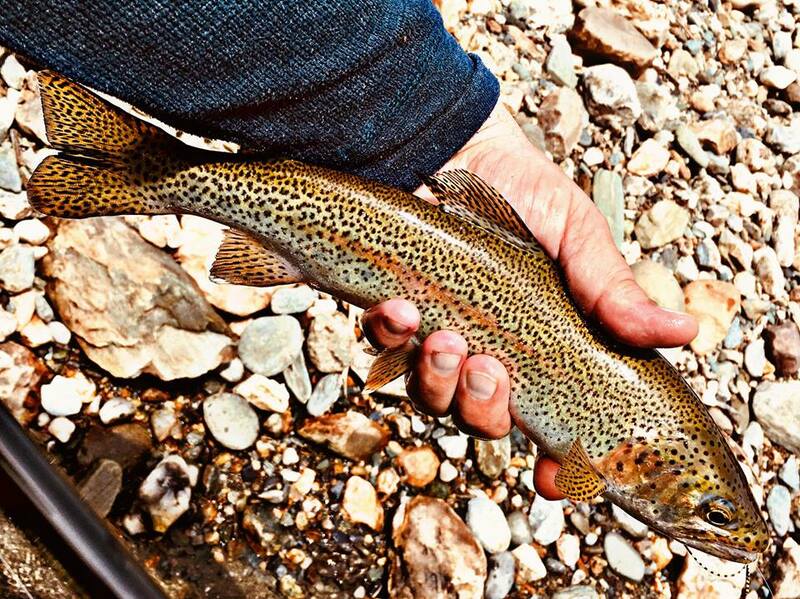 But I had heard some rumors that some wild trout were still to be found in the White River. 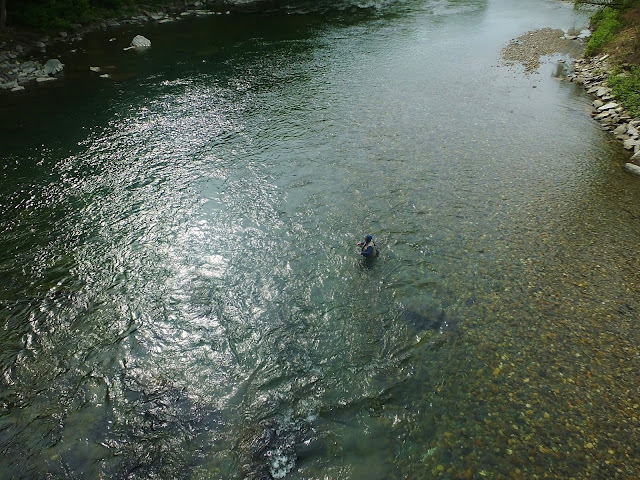 So, when my friend Mike asked me a couple weeks ago if I'd be interested in joining him there, I said yes, in large part because I was very interested to see what had happened to this river that I had read so much about. There were next to no reports since 2013. The Orvis page for the river said "destroyed by floods" and had not been updated once since that year. What would we find there? It was a bit of a mystery. It would be a real adventure. Reaching the river a little while after sunset, we parked in a spot where we couldn't see the water and started to rig up. Mike noticed it first. A delicate rusty spinner, dancing over the car. While we rigged up more gathered, and by the time we were ready to go down to the water there were at least a dozen hendrickson spinners in the air above Mike's car. We walked down to the river, and the view was a bit stark. What should have been thickly vegetated riparian zone was either devoid of growth or had only small shrubs and knotweed. Very few trees grew close enough to the bank to provide continuous shade over the water. Rock provided almost all of the cover. Riffled water appropriate for holding trout was minimal. The water was stunningly clear and green. What I saw was very pretty looking, but knowing the what wild trout require to survive, it did not instill much confidence. Then, in very hard water, Mike caught the first fish. A wild rainbow. Then another. And another. After covering a fair bit of water in our first stretch and loosing a quite large smallmouth, I presented a CDC caddis to a splashy riser, the top fish of four that were all working the same seem, and it took. I set a after a second to let her turn and my glass rod bent deep into the cork. Soon a 14 inch wild rainbow went airborne. It was my first Vermont trout, and to have it be a gorgeous wild rainbow was a treat indeed. 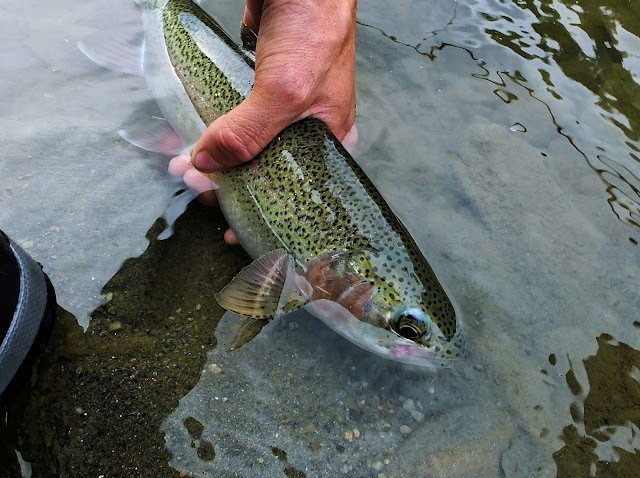 Our second spot ended up being the most productive we'd fish all day, giving up an absurd number of rainbows, both stocked and wild, during a morning caddis emergence and an evening spinner fall. We doubled up there probably a dozen times. Unfortunately, almost all of these fish were cookie cutter 10 inchers, and if they weren't that size they were smaller. 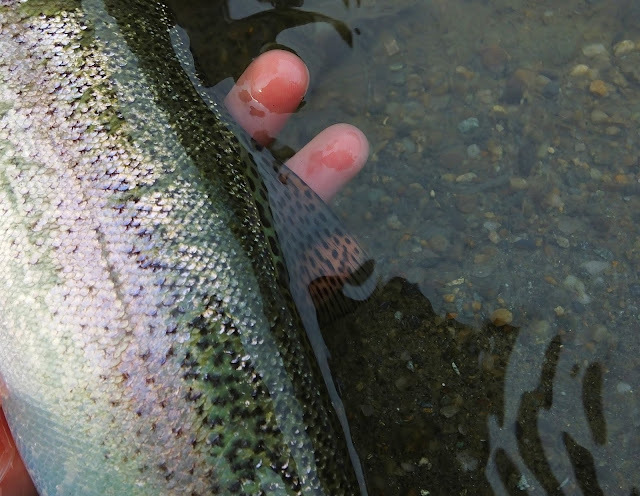 We found that all over the river: pockets with lots of trout, but almost no sizable fish. I never caught or hooked one bigger than my first, though I saw a couple, and neither did Mike. 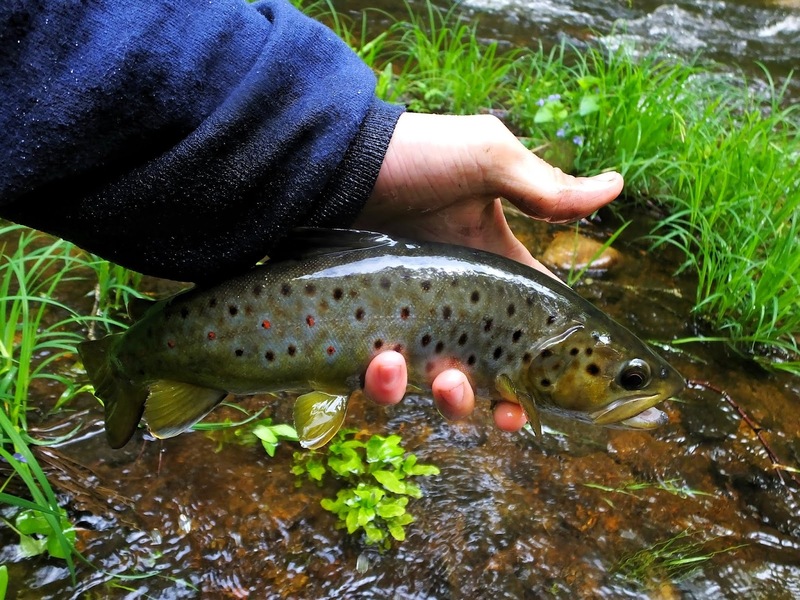 We also didn't catch many brown trout, and the ones we did catch were freshly stocked. They all came from the same pool. I did catch one wild brown, but it was all of three inches long. We also didn't find brook trout in any of the tributaries or branches we fished. Was it surprising to find the fish population so limited? Not really. I was amazed we caught as many as we did, and for the condition of the river and its recent history, it fished exactly as it should. We caught a lot of small trout, many of them healthy and wild. There was bug life and a little bit of baitfish life. From the sounds of it, what we had was an exceptional day compared to most days in recent years. 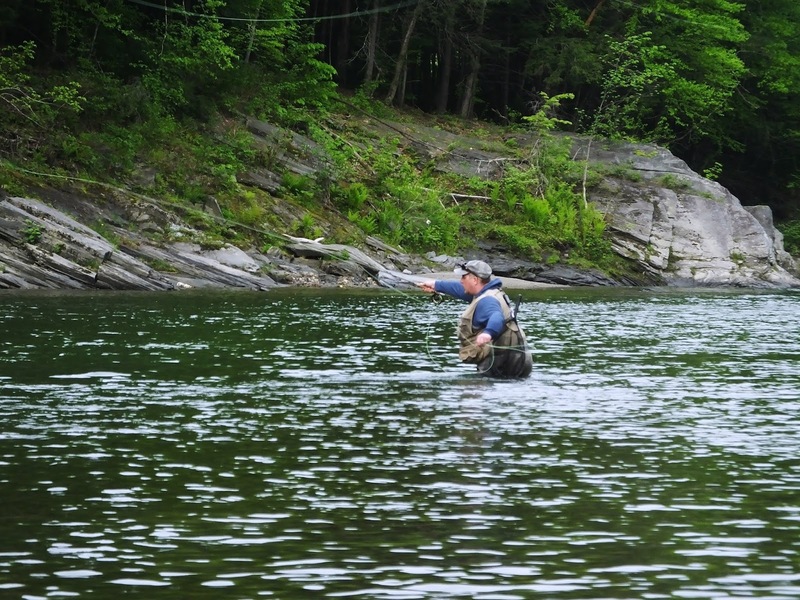 With exceptional action and near perfect weather, we never found big fish that were catchable. Mike and I are both experienced trout fisherman with a lot of tricks up our sleeves. I know if there were as many big trout as there should be in a river that size, we would have caught a couple. One of the cooler fish I caught wasn't actually a trout, it was a smallmouth bass. 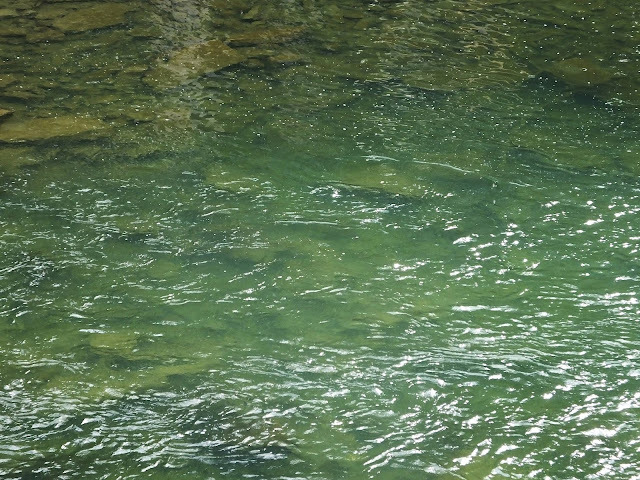 Looking over a broad, deep pool that I was very much tempted to go for a swim in, a spotted a nice bass. I tied on a black woolly bugger and stripped it past. the fish followed but did not take. On the next cast I let the fly fall right down into the rocks. It got hung up. The bass charged over and plucked it right out of the crevice. It wasn't huge, but it was a gorgeous bass, with hyper-pigmentation almost giving it a mask, and the brightest red eyes I've ever seen on a fish. In 10 spots fished in 14 hours on the water, Mike and I caught a lot of fish. It was a nice day. About the best thing about it was there was hardly anybody out there, even on a memorial day weekend. We must have seen less than 15 other anglers. I hate to name rivers, especially sleepers, which the White certainly is now if it wasn't before, but I see a need for advocacy for this watershed. It badly needs help, because it hasn't recovered yet. The water quality is coming back and so are the bugs and some fish, but there is one thing that is obviously missing. It takes only a few glances to see it. There is not enough cover here. What this river needs to have in order to come back is some serious habitat work. Tree planting, log depositing, shade making. 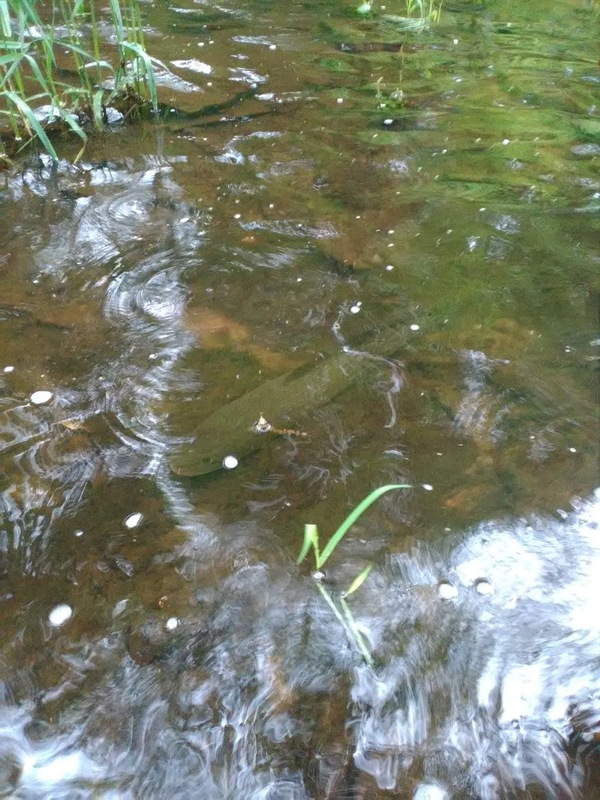 I can't imagine how difficult it is for these fish in low water with the lack of in-stream cover and shade. That is almost certainly what is slowing down this river's recovery the most. The potential is there, wild fish still swim the White River, but it is going to take a lot of time and work to make this fishery good again. 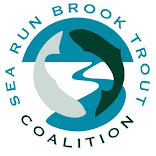 There is a species of fish that, in this time of over harvesting and by-catch, only visits the Connecticut shoreline for a few weeks in the spring. If it weren't for a number of dedicated followers, it could come and go without being noticed. 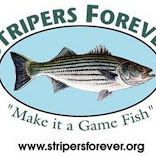 They pass through with little show, not slashing and tearing through bait like bluefish and albies or popping and blitzing like stripers. Their preferred feeding areas are limited. They are incredibly boat shy, leaving only paddlers with a chance to spot them on their electronics. Catching one by accident while fishing for stripers or bluefish is rare. But, for a short period of time, if you know where to look and how to fish, you stand a chance of encountering probably the most ghostly of the New England inshore species. Squeteague. 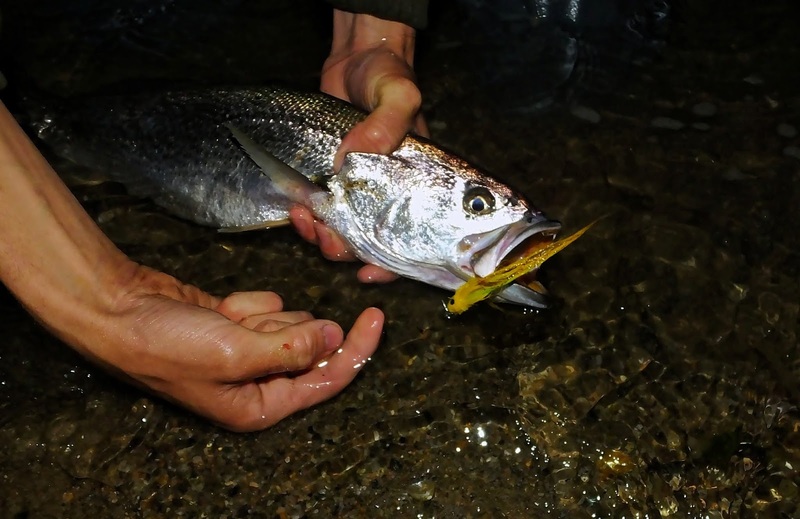 Weakfish. Tide runners. Last year, Dan and I missed them. 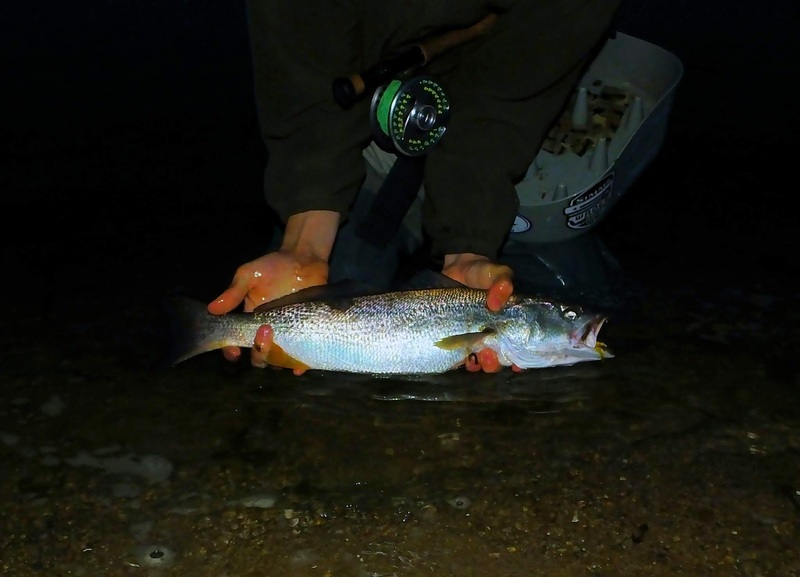 Under the startling blood red full moon I've ever seen, we found no evidence that weakfish were in the area, and a little evidence that the had been recently but had gone. This year, we got to the stretch of sand we had chosen and found it not so lonely, which was a good sign. 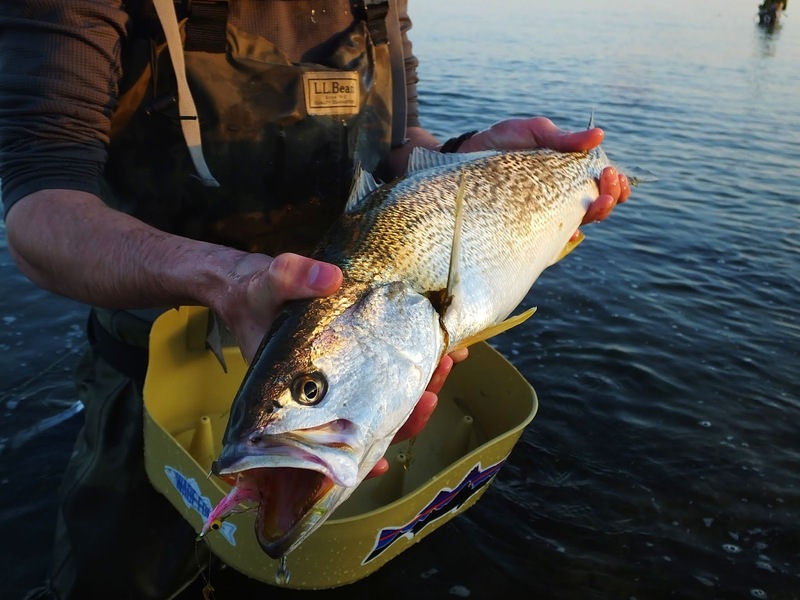 The number of spots with weakfish is limited. Even though there is a very finite number of anglers in the know, if you are on the water in the right spot at the right time. You are going to be in a line up. We saw one sea robin caught. Then, just a short time in, after a little moving and wondering what we should be doing, Dan came tight. Soon, I tailed one of the most beautiful fish I had ever seen. It started drumming loudly as I walked it over to Dan. A couple hours later, after learning an awful lot in a very short time window, I felt an ever so slight pressure. 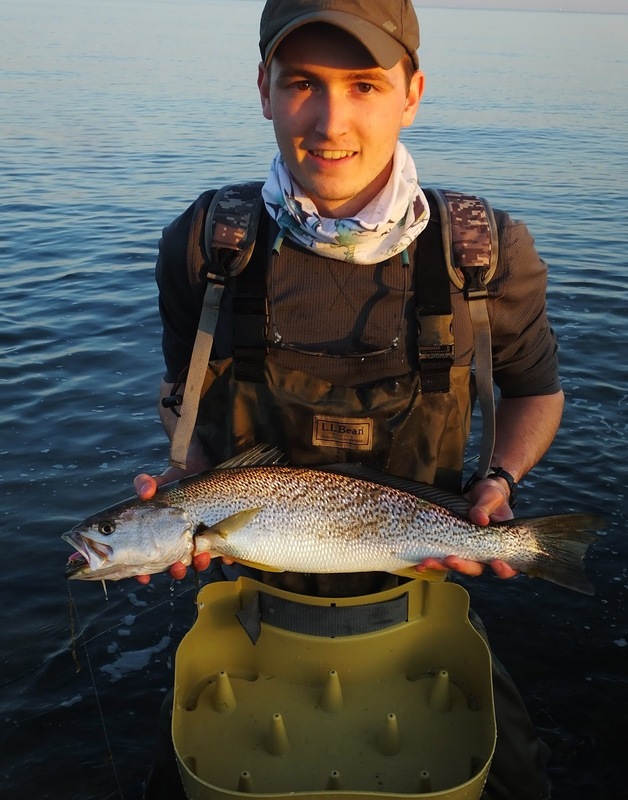 I sped up my retrieve and came tight to my first weakfish. Species #75. For me, this is a very special fish. It is a species I very much hope to encounter again in the coming days. Hours of research lead to this pay off. I owe thanks to Ed Mitchel, Jimmy Fee and a few other for sharing knowledge through writing. A couple nights ago, I went out to target a new species, one I had heard was quite difficult to catch on the fly. I have hooked a few in the past and broke them all off. They have big, paddle like, leathery tails that make the exceptional fighters. When hooked they often give a violent tail slap. They can usually be found around the stick and mud nests they build. I'm just kidding, of course! I was looking for something in the perch family. 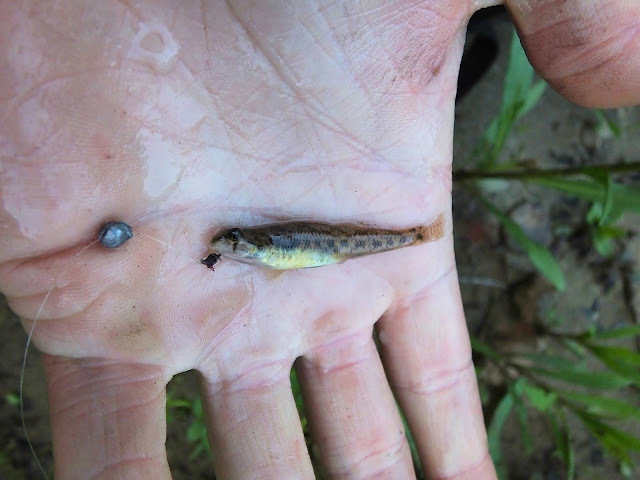 Tessellated darters, though tiny, are indeed close relatives of walleye and yellow perch. 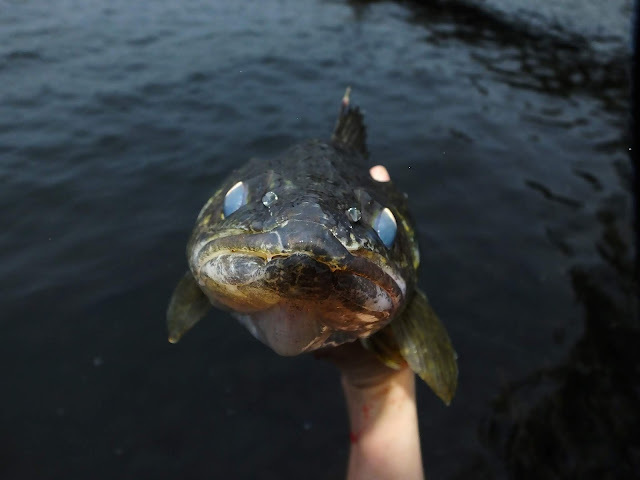 Other darters, like rainbow, plateau, yoke, and banded darters are dramatically more colorful, but tessellated darters are far from ugly and are very charismatic. They were far more aggressive than I expected, even attacking my splitshot. I almost caught a second new species, I had two takes from a small bowfin, but I failed to get a hookset. I hadn't caught a new species in months so maybe that was asking to much. Tonight I'll be fishing for a species I haven't caught before, maybe, just maybe, I'll get one or two. Small stream water temperatures have been in the high 50's and low 60's lately in these parts, which for my tastes is about as good as it gets. 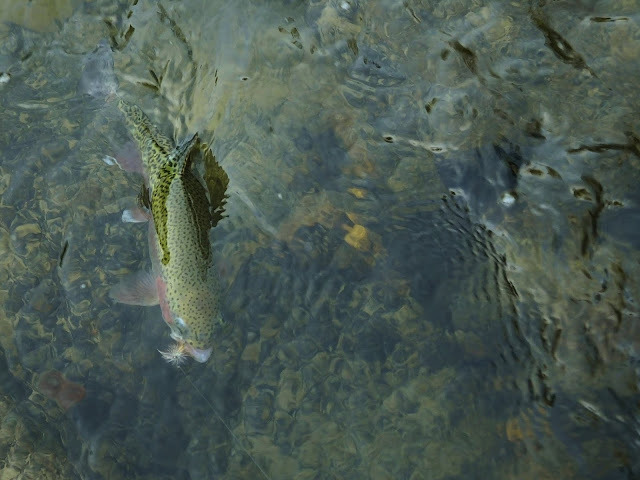 These water temperatures in mid spring result is great fishing with the two most exciting ways I can think of to fish for small stream wild trout: big dry flies and lightly weighted streamers. 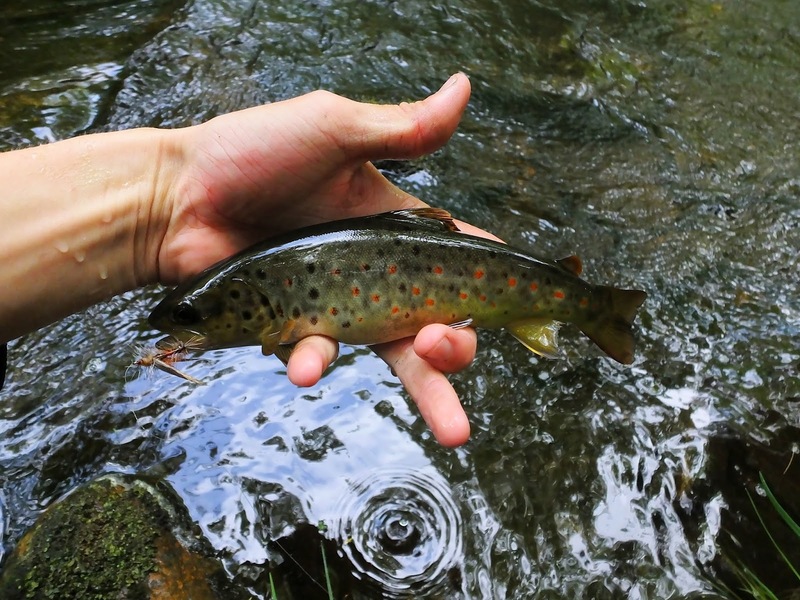 I utilized both two days ago targeting both brown trout in my home river and brookies in a very tiny tributary. It was a blast. The first wild brown of the day was an exceptional specimen of about 12 inches. I cast my salmon parr streamer into a foam covered back eddy and it was promptly hammered. 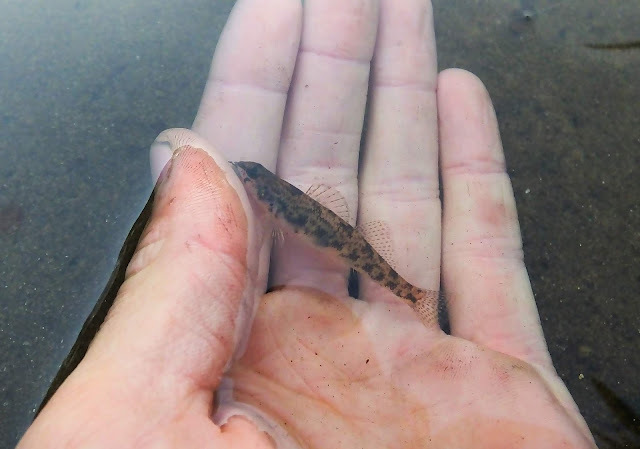 This fish did not want to come up, plastering itself to the bottom and slowly swimming upstream in very heavy current. I was thrilled when it finally did come up, what a gorgeous fish! After a little while I changed to a stimulator, hoping to maybe entice a wild brook trout or two. I didn't, but the browns took to it very well. As it got later hatch activity diminished but the spinners stayed in the trees. I wasn't getting the action I wanted. So I switched back to a streamer. In the first run I worked it through I got an incredible acrobatic take followed by a blistering downstream run by what turned out to be the fish of the day. I caught a few more wild browns before I decided it was time to go visit the tributary to see how it's miraculous wild brookies were doing. 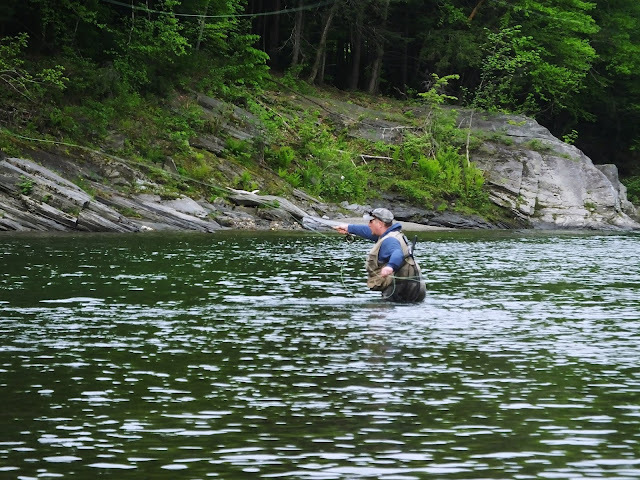 I say miraculous, because of all the wild trout streams I have fished in CT, this is the smallest. It is also heavily segmented by plunges and falls. It blew my mind when I first saw fish in there. I caught two on this visit, but for this water they were real trophies. Many mistake my preference for wearing the same hat on every fishing trip for pure superstition. That's not really the case. It's not my "lucky " fishing hat. It has a purpose. It shades my face. It keeps my head dry. It keeps my hair, when it is long, from blowing into my face. It helps with sight fishing under a high, bright sun. A good fishing hat must be comfortable. Unlike anything else, my fishing hat is with me on every single outing I make. Confidence and comfort is low without it. A good fishing hat isn't lucky, but if I want to have a good day I damned well have it on my person. That is a bowfin. A species I have been trying to catch for a while now. Just sitting there in the shallows of a small freestone stream. Had I had a rod with me, I'm pretty sure I would have caught it. When I got home I switched my pins over to the hat I had been wearing. It was a bit more comfortable, it was the right color, and I had begun to believe this one might actually have a bit of mojo, considering the bowfin encounter. So I wore it fishing. And, though I knew the conditions were primed for it, I somewhat unwittingly stumbled into the best walleye bite I've ever had. 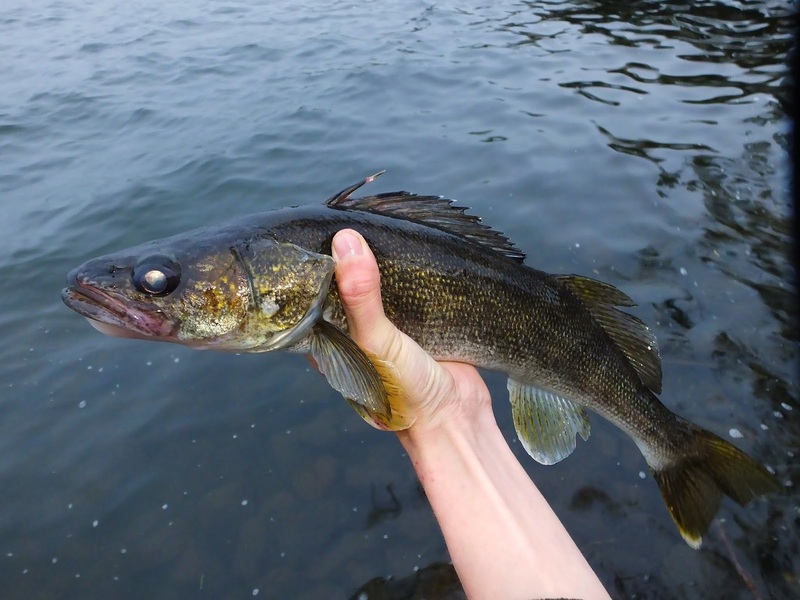 In the waters I fish, schooling walleye are rarely accessible from shore, and even from a boat they are difficult to find with fly tackle. Two walleye is a good day. Three is exceptional. 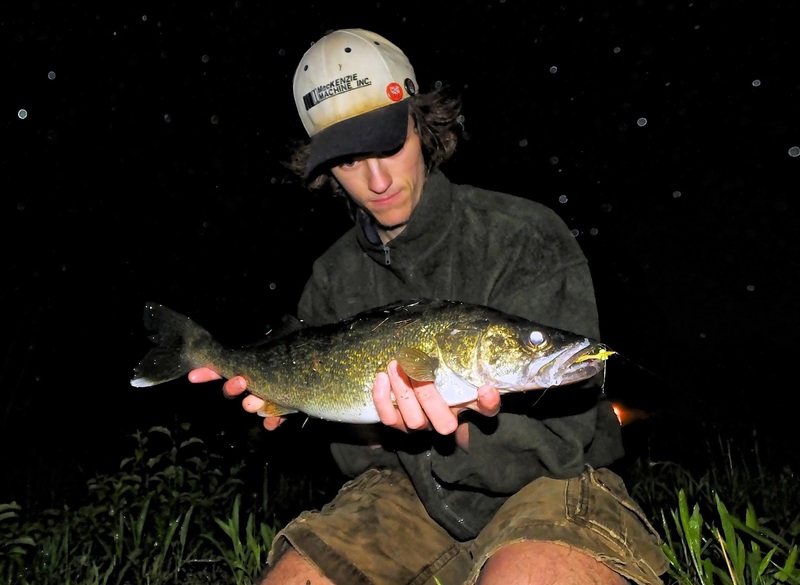 On this night I hooked seven and landed five, and only one was under 20 inches. I pride myself in knowing when to stay and when to go and knowing how to best capitalize on bite windows. When the school I first found got shy, I knew where I had to go. The variables were clear to me. Current. Water temperature. Insect life. Bait fish. Structure. I moved to a spot where those variables should be almost the same, they were, and it payed off. That's when you know you are a good fisherman. I wasn't chasing reports, I wasn't following someone else. I saw potential, I chose an area that had productive in the past under similar conditions, and when I had fished it out I knew where I could repeat that result. I did it on my own terms. Stay on your toes. Fish in bad weather. Be mobile. Pay attention to detail. And, most importantly, find a comfortable hat. 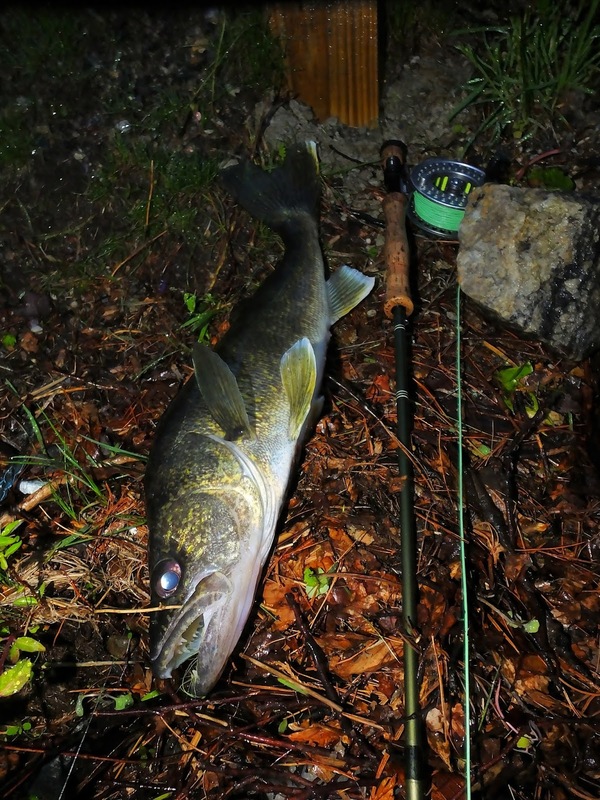 Fish like feeding during less than pleasant weather. That has been proven time and time again. That doesn't mean there won't be great bites on sunny, calm days, but if you want to catch them with the best of them, fish in nasty weather. Early in the week the northeast had a setup that was prime to explode. I was watching the weather closely a few days out, and when it came time it played out exactly they way I expected and hoped it would. It was one of the more memorable severe weather events in the northeast in recent years. As soon as I was confident it my forecast the day of, I went to fish the pre-storm bite. A strong, wet southwest wind pushed insect life into the creeks and south facing shorelines, and a darkening sky and dropping pressure had the fish worked up. 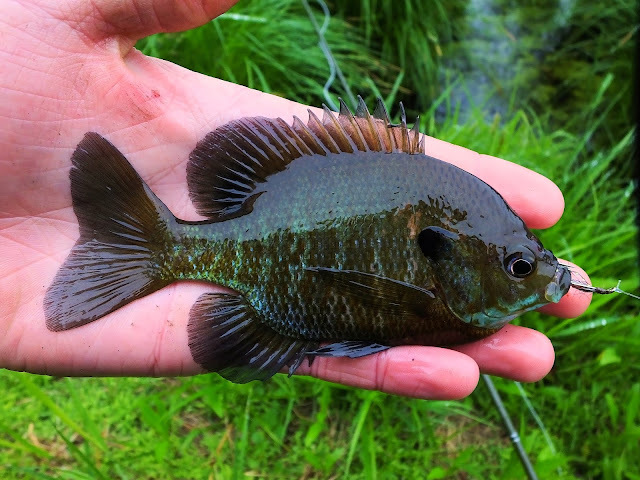 I caught the biggest rockbass I've ever seen, a couple dozen perch, some bluegills, a smallmouth, and, interestingly, a bunch of largemouth. Catching largemouth here isn't unusual, but catching five of them and only one smallmouth is pretty atypical. 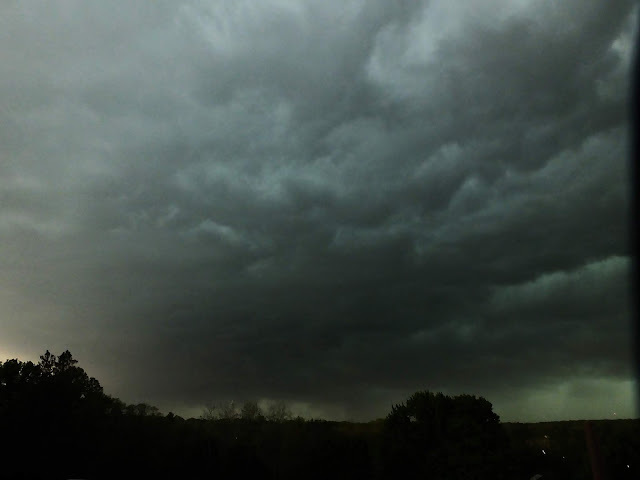 As soon as the gust front of the approaching line of severe storms crested the horizon, I got into a good position to watch the show. Within 10 minutes the county was under a tornado warning. 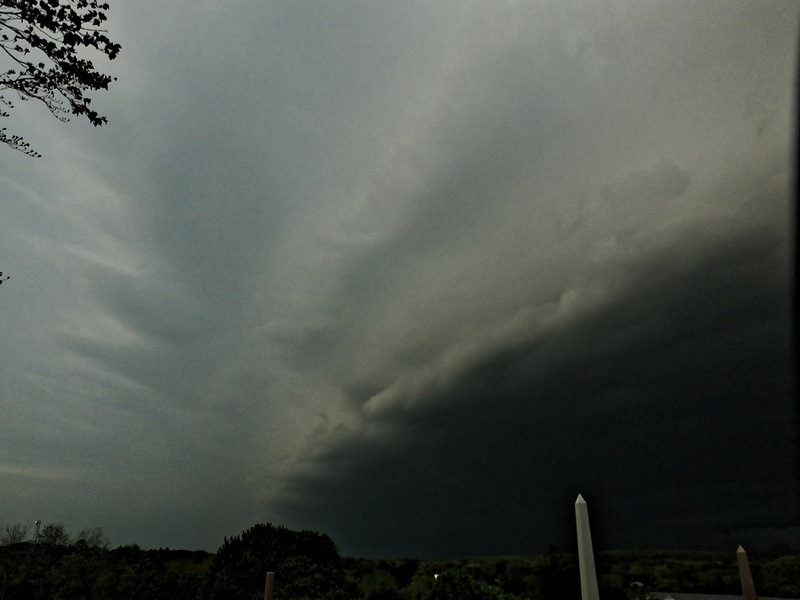 The storm was linear in nature and fast moving. I didn't have much time to work with. 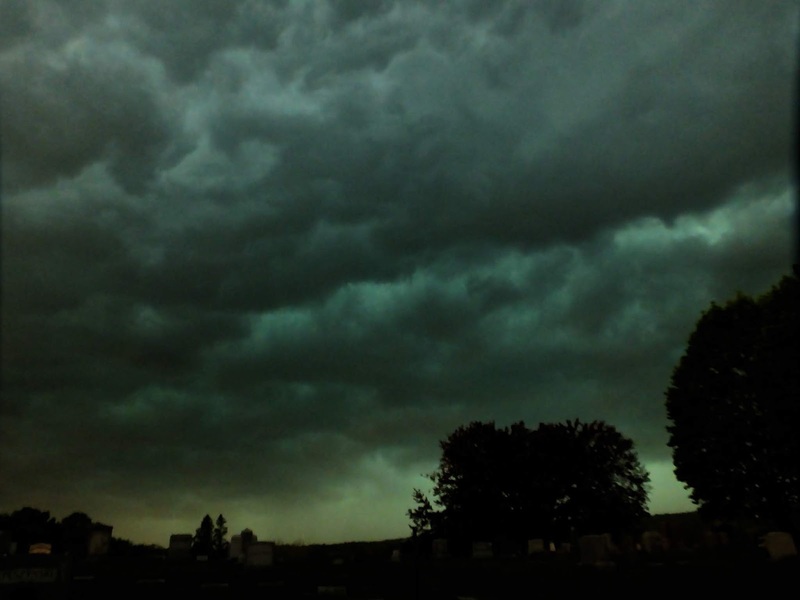 Yesterday, the conditions favored stability, weather wise. It was cold, rainy, and breezy. 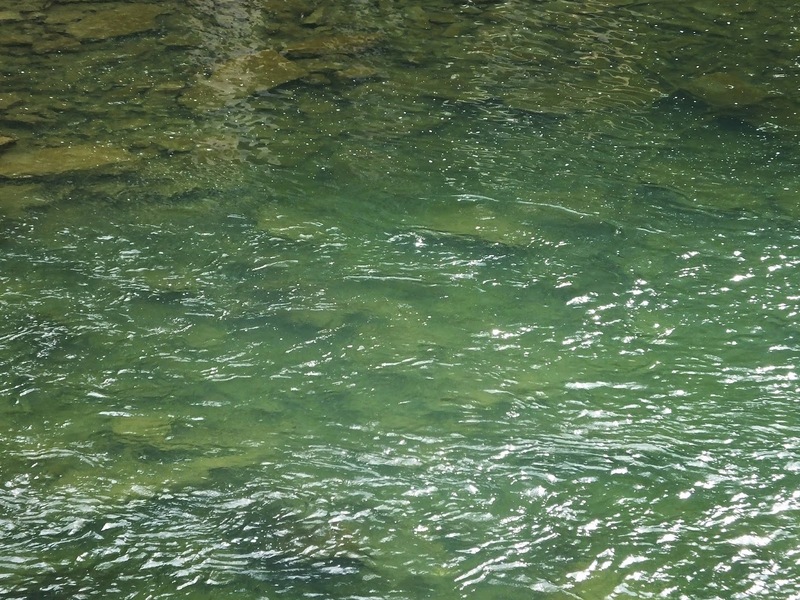 Some species of fish will shut off under these conditions. Others will go hunting. 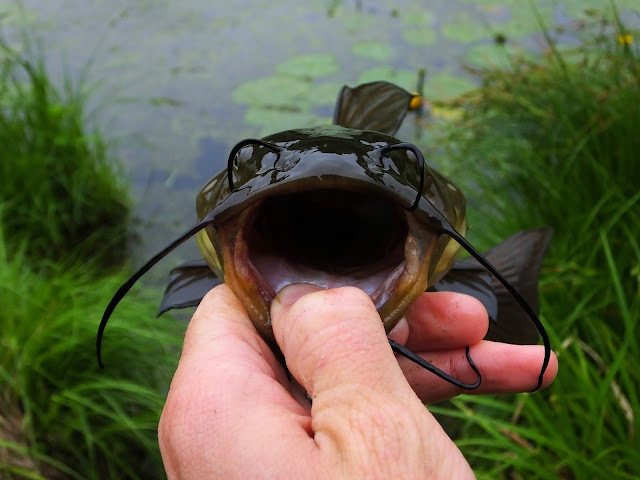 Bullheads are one such fish, and they were hungry yesterday. 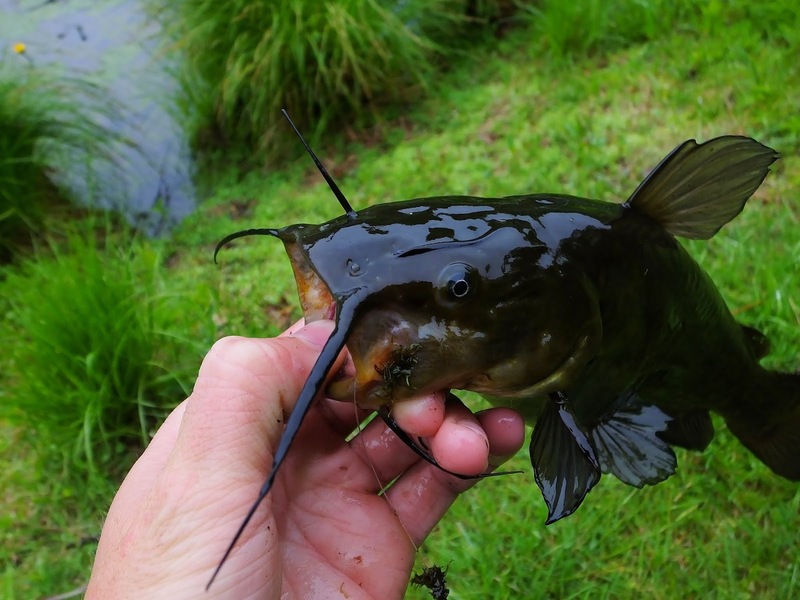 I caught bluegills and bullheads on both bait and artificials in a steady, misty, uncomfortable rain.